Move over, Batman — there's a new Dark Knight in town. 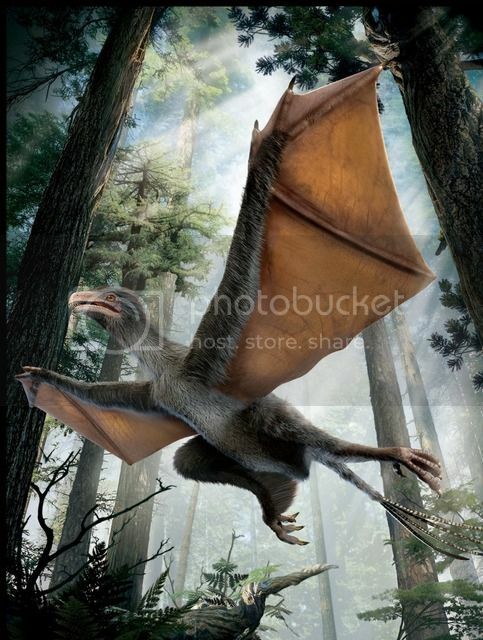 A tiny dinosaur with batlike wings may have glided through the Jurassic forests of what is now northeastern China, say paleontologists who analyzed the animal's bones. Unlike any dinosaur ever found, the feathered pipsqueak may have been a failed experiment in early bird flight, the researchers say. The researchers estimate the creature weighed less than a pound (380 grams). The specimen also had feathers, but not the kind used for flight, the researchers said. Yi qi probably wasn't a great flyer, and most likely moved through the air by a combination of flapping and gliding, Xu said.